Cesarica is a small fishing village which developed to the holiday resort, in quiet area, perfect for rest, relaxation and for families with small children. Cesarica is also perfect for vacation without urban noise, without concern for parking, no traffic chaos and mass tourism. You can fishing with your children, dive, hunt octopuses, enjoy the crystal clear sea which is only 200 meters from your apartment or to go for a walk. In this area is one of the best European climate and of course perfect nature. That are 2 more reasons for your visit. You can also spend an active holiday. From our place you can go with a car in short time to the mountain and there drive quad in Nature park, drive kayak safari, play paintball, rope climbing, caving, hiking by Velebit and much more. You can also visit famous Croatian national parks (Plitvice Lakes, Paklenica and Northern Velebit), old towns (Zadar) and islands (Pag, Rab, Krk) in a very short time by car. You can visit the island of Pag (party island) by car and ferry and there enjoy at partys on Zrće beach (croatian Ibiza). 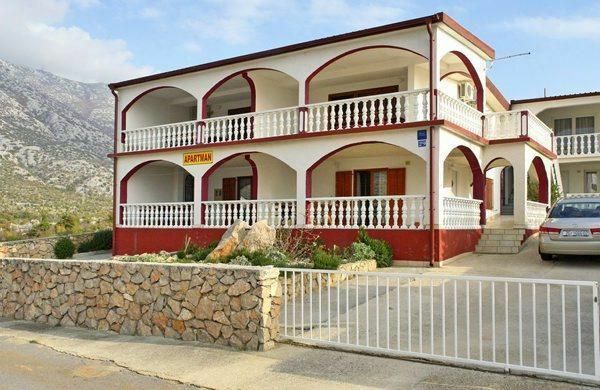 Cesarica is situated in a beautiful bay at the foot of the Velebit in the same channel, 6km northwest of Karlobag. Cesarica is a wonderful place where You can see combination of sea and continent with crystal clear water and the most beautiful Croatian mountain Velebit. There is our new house with 4 newly furnished apartments. Each apartment is 35 m2. Behind the house is barbecue for our guests. Parking is available in front of the house. Maximum occupancy of Apartment 4 is 4 persons. Bed linen, towels, electricity, gas, final cleaning and else are in the price. Washing machine is not in the apartment, but it is in another room in the house. There are 3 beaches nearby (2 pebble beaches and 1 concrete beach). It takes about 5 minutes to any beach when you go by foot. To the pebble beach you can get in one minute by car. In Karlobag also are few beaches. In Karlobag is a Beach Bar which is open to 4 AM. If you have a boat, we have a mooring place in the harbor which is only 5 minutes away from our house when you go by foot (by car 1 minute). Plitvice Lakes National Park is the largest ​​national park in Croatia and at the same time the oldest national park of South East Europe. The National Park is world famous for its 16 cascaded lakes. In the National Park area are many endemic species. National Park Paklenica- Paklenica is national park since 1949. This national park is ideal for climbing, to see fauna, forests, wildlife and cultural heritage. Zadar city is situated in the south of Croatia on the Adriatic Sea. In Zadar are many interesting objects such as the Church of St. Donatus from the 9th century and cathedral. This city is ideal for people who love history. Pag (party island) - Pag is one of the most popular Croatian islands. The main towns of the island are Pag and Novalja. In Novalja is situated Zrće beach. There are the best parties on Croatian coast. You can go by car to Prizna and from there with ferry to the island of Pag. There is also a boat for excursions to island in Karlobag. That boat also drive to the island of Rab and cove Zavratnica. Island is also known for cheese and lamb. Bay Zavratnica -Zavratnica is certainly one of the most beautiful bays on the Croatian coast. Due to its natural beauty it was declared in 1964 a protected area. You can go by foot to the bay, using a beautiful sea road, which runs from Jablanac, where is the ferry port to the island of Rab along the coast. In bay is also an old ship from WW2. St. Theresia trail- This street has Austrian Emperor Joseph II. in 1786. made and named after his mother, Maria Theresa. The route is intended for pedestrians and especially interesting because you can see two faces of the Velebit mountain range in its full beauty in a short distance. The Premužić trail leads through the most beautiful and interesting parts of northern Velebit. From the peaks you can enjoy a breathtaking view of the Adriatic Sea and the islands of Pag, Rab, Goli, Prvić and Krk, as well as on the continental side of Lika. Kubus- This monument for the construction of the road Karlobag- Gospić on the Velebit is a sculpted stone cube (cube or Ura called). From Kubus You can see a magnificent view of Senj, Pag and the entire Velebit channel on the height of 927 meters.